In the month of April 2016 Staat van Beleg could list 568 human rights violations (and 125 reports/analyses). Every month we focus on a violation or an incident which caught our attention or a violation that occurred frequently during the reported month. This month we read in an article from WAFA (Israeli Forces Chase Down Palestinian Sepherds, Seize 120 Sheep) that Israeli occupation forces chased down Palestinian shepherds in the Masafer Yatta area in southern Hebron, and seized around 120 sheep. How strange this may sound to us, the shepherds of Masafer Yatta are suffering these violations on a regular basis. Masafer Yatta, a collection of almost 19 hamlets, is located in Area C of the West Bank, and is under full Israeli administrative and military control. The area, also called ‘Firing Zone 918’ has been subject to repeated Israeli violations by settlers and soldiers targeting their main source of living, livestock. 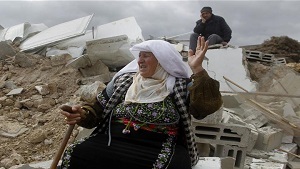 The area relies heavily on animal husbandry, and has been a frequent target for recurrent Israeli assaults, including demolitions of animal barns, homes and residential structures. 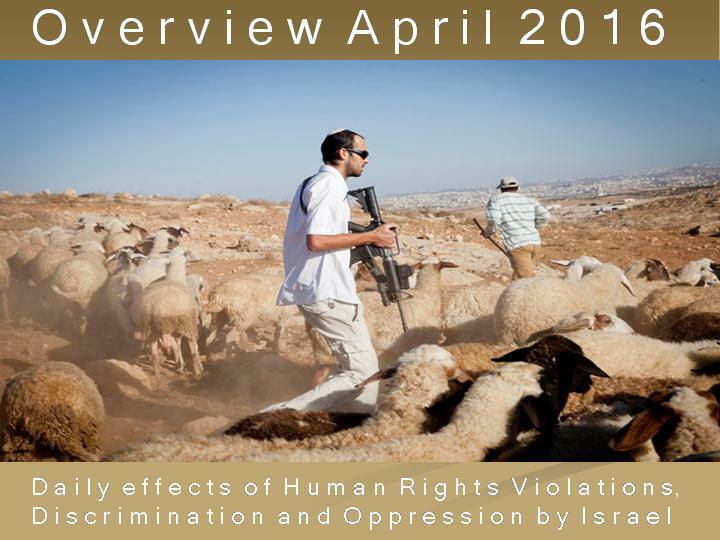 This article of Electronic Intifada of 16 March 2015: In photos: Defying Israel’s demolition orders in the South Hebron Hills, and an info-sheet from ‘The Assocation for Civil Rights in Israel’ updated until 21 February 2016 will give you an impression of the daily struggle of the landowners, farmers and shepherds of Masafer Yatta. 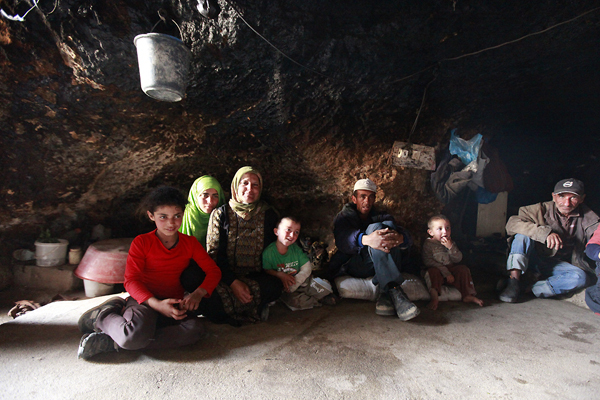 Family of Fadel Hamamdi gathered in their home. The caves are usually divided into three areas: a living area, a storage and cooking area, and one for livestock in winter. These communities of farmers and shepherds are not the only victims of violations by Israeli forces and settlers on an almost daily basis. Palestinian farmers whose land lies within or close to an Israeli-enforced buffer zone along the border with Gaza face near-daily fire or threat of fire from Israeli forces, often preventing them from cultivating their crops, according to documentation by rights groups. *The outcome is based on our findings through our monthly reporting and does not give a full picture of the violations against these groups. First of all since not all violations are covered by the press and secondly because other violations, like the enormous land grabs for expanding through illegal settlements, are not included. These losses of land are also losses of agricultural land. Not all violations of water contamination are mentioned since these are violations where more groups of people are being harmed. Also not all cases of collective punishments are mentioned, like fencing off village’s which will also harm farmers since they cannot reach their farmlands. And let’s not forget about the restrictions on fishing because of the implemented fishing zone.